Mayor Miro Weinberger announced Wednesday morning that he will not support a Burlington City Council resolution calling for an alternative mission to the F-35 fighter jets, which are slated to be based at the local airport in 2019. Weinberger consulted with the Vermont Air National Guard and federal officials who he says satisfactorily addressed noise and public safety concerns raised by the public and a series of investigative stories by VTDigger. 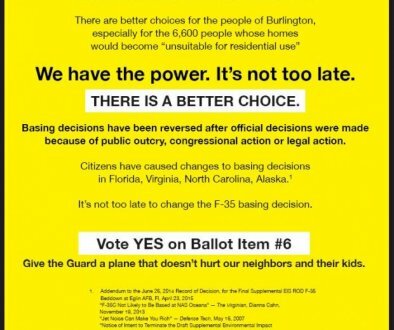 Burlington voters on Town Meeting Day rejected the basing of the fighter jets at Burlington International Airport and asked that city leaders urge the Air Force to give the Vermont Air National Guard an alternative mission. A City Council resolution passed on March 26 reflected the will of city voters. Weinberger will not sign the resolution. While the mayor previously said he would reconsider his backing of the F-35 basing if voters opposed the fighter jets, he is now reiterating his support for the planes.